Note: The German edition of Dr. Detering’s article has now appeared and is linked to his website here. The English edition, translated by Stuart Waugh, is forthcoming. (This post has no color coding, as it is entirely my commentary. In his treatment of the Exodus theme, Dr. Detering’s argument centers on the element of water and its allegorical interpretation. As noted in the preceding post, already in the third millennium BCE Elam had a sacred water ritual, and the Mesopotamian divinity Enki was Lord of water, of wisdom, and of creation. We may ask: Why was water used as a sacred symbol from such very early times? One answer that immediately comes to mind is the emergence of agriculture. With the onset of farming in the Neolithic Period (c. 10,000–c. 3,000 BCE) water redoubled in importance. It was life not only for people but now also for crops. That is certainly true. But even in Paleolithic times people necessarily lived close to water. Also, if they traveled any great distance they learned (or they learned from their neighbors, who learned from their neighbors) that progress would eventually be blocked by a vast and supremely impassable body of water—what we call a sea or an ocean. To Stone Age man lacking maps or globe, it really seemed like the earth is entirely surrounded by water. And indeed it is, for all the land masses are surrounded by water. The watery ocean encompassing all man’s activities impacted more than mythical geography. When, in the Neolithic Period, people began to take more than passing notice of the sun, moon, and planets, they supposed those great celestial bodies rose each morning out of the great ocean beyond the eastern horizon. Then, in the evening, the celestial divinities descended back into the ocean, now in the west. This meant one thing: the home of the gods was the great, encompassing, ocean. Furthermore, because the gods emerged from below the eastern horizon and re-entered below the western horizon, our remote ancestors concluded that the ocean under our terrestrial earth was the home of the gods and the place of ultimate truth. When the sun has with fiery chariotry fulfilled the day’s course, having in the whirling of his course become like fire and flared up like a torch, and when he has blazed through his course’s meridian, then as though reluctant, if he should appear close by, to burn up the land with ten radiant lightning shafts, he sinks into the Ocean. The Tsodilo serpent, perhaps mankind’s most ancient sacred sculpture. For early man, the journey to transcendence, truth, and divinity (especially undertaken by the shaman) was in the downward direction. Deep caves leading into the earth presented fortuitous openings and sacred avenues to the divine. In this context we should view paleolithic cave art, found in the dark, innermost recesses of mountains. That art witnesses to early man’s efforts at transcendence and communion with divinity. Not only were caves holy, but the serpent—that master at navigating crevasses in the earth—was perhaps the first ‘sacred emissary’ (messenger, angel) from and to the divine realm below. Lacking lids, the serpent’s eyes are ever open—as if it is all-knowing. Furthermore, because it sloughs its skin, the serpent seems to have conquered death and to possess the secret of immortality. It is no coincidence that, in the imagery employed by Gnostics through the ages, the serpent is their preferred carrier of wisdom. Of course, in anti-Gnostic polemic the serpent is the ultimate villain. 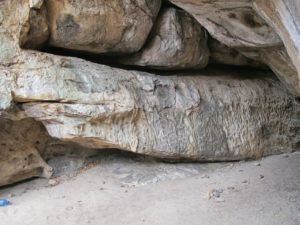 In the virtually inaccessible Tsodilo Python Cave of Botswana, Southern Africa, a colossal serpent, twenty feet long and as high as a man, is carved in stone. The context is clearly sacred and the entire ensemble dates back about 70,000 years before the present. It may, indeed, be one of Homo Sapiens’ first works of ‘art.’ Interestingly, behind this giant serpent was a hidden shaman’s cubicle. The foregoing teaches us that ‘primitive’ man was already developing quite abstract insights and that he was thinking allegorically. The serpent would only have had sacred meaning in a context such as that described above: the gods live below, and the serpent is their blessed emissary to man. Physiological and psychological factors (these have been well researched) buttress the above. There is not space here to enter into detail, but a profound feeling of falling/passing through a downward spiral accompanies the extensive loss of blood that attends the ‘near death experience.’ Having passed through the descending vortex (as reported even by modern victims—see Dr. Raymond Moody’s Life After Life), the now transcendent soul ‘on the other side’ approaches a loving, all-knowing ‘Being of Light.’ This experience is universal and ancient. Parallels between the Being of Light and Jesus of Nazareth are uncanny. Stone Age cosmology can be summarized as follows: The divinities lived in a great watery home, one they left during the day and to which they returned at night. That watery home was below the earth and extended from horizon to horizon. It was imagined that the heavenly deities traveled from west to east during the night (reversing their course of the daylight hours), to re-emerge at the eastern horizon in the morning. The gods lived exclusively in the transcendent, watery realm. They moved placidly quite apart from this nasty, temporary, and brutish terrestrial existence. (1) Truth is metaphorically (and physically) not on high, but below. (Consider the etymologies of our words profound, fundamental, basic, the phrase ‘deep wisdom,’ and so on.) We moderns consider truth as that which is self-evident, in the open, and available to the senses for all to see. The ancients saw it otherwise: what is visible is a veil, a sham, a decoy (cf. the Buddhist concept of mâyâ). 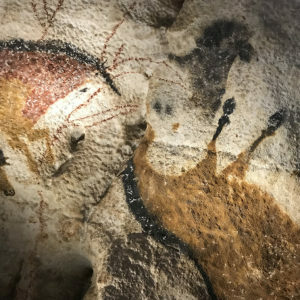 The truth is hidden and deep—just as is paleolithic art. It is obscured under what we can see, or even by what we can see. (2) The gods were ‘at home’ during the night, after the sun returned into the ocean whence it came. Broadly speaking, our entire existence (whose activity takes place principally during the daytime) is a sort of aberration, mirage, or flight from reality (again, the Buddhist mâyâ comes to mind). Deep truth is most present at night—and particularly in dreams. (3) The moon was exalted, for it dominates the night. Furthermore, the moon rules water—immediately noted by its pull on the tides. In Bronze Age religion, the moon deity (Nammu, in Mesopotamia) was vastly superior to the sun, and the cool light of the night was superior to the hot light of the day. Ancient man was also endlessly amazed at the moon’s ability to shine in the darkness. The sun cannot do this. In fact, it must have appeared to our ancestors that the sun, for all its daytime hubris, simply abandoned mankind each night. That was precisely when the moon emerged as a friend, to guide our forefathers through the darkness. It is no coincidence that ‘gnostic’ movements through history have been devoted to the moon—from Enki (the Babylonian water-god), to Osiris (Egyptian moon god in the 18th Dynasty), to early Israelite veneration of the moon (on this, see here), to Nabonidus (sixth century devotee of the moon god Sin), etc. It can be argued that all these inclinations were gnostic, anti-materialistic, and also very much in the minority. The reigning priesthood of each era had a ready term for them: lunatics. Yet the moon endlessly impressed and amazed our ancestors. They were thrilled at its ability to shine at night—that is, to produce its own light. This must have appeared unfathomable, wonderful, and quite heroic. Beginning on the first day of the month, ancient man watched a celestial drama unfold as night after night the undaunted moon slowly waxed greater and greater. It was a mighty lesson—well, really a double-lesson, played out on the vast canvas of the sky: that we, too, must produce our own light, and that we, too, can overcome the darkness. Even immersed in total darkness, there is always hope. It is no wonder that the moon was man’s first divine friend and his trustworthy mentor. Sunset on the first day of each month—the New Moon—was a time of great celebration among the common people. It was also the holiest event of the month. Some temples (especially those on hilltops, as at Petra), provisioned with the symbolic water of gnosis, were oriented to the eastern moonrise three days after the summer solstice. Why the summer solstice? Because that date marks the beginning of six months when the night (which is at its shortest) becomes longer, and the day shorter. Thus, the summer solstice is a ‘big brother’ analogue to each new moon, or lunar birth. Though June 21 is the day on which the sun shines most spectacularly, it is also the day marking the beginning of the sun’s decline. Metaphorically speaking, then, the beginning of the sun’s death is also the beginning of the moon’s birth. And why the three days’ delay? One might say that, metaphorically, three nights of darkness take place before the new moon appears. Practically speaking, however, there is a several day delay in effect: though the solstices theoretically take place on Dec. 21 and June 21, the very slight changes in length of day/night are not suddenly appreciated. For this reason, the Roman mithraic celebration Dies Natalis Solis Invicti (“Birth Day of the Invincible Sun”) took place not on Dec. 21 but on Dec. 25, when the daylight hours are appreciably longer. 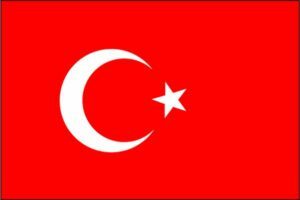 The Christian Church appropriated that celebration for its birthday of Jesus. I now touch on a number of fairly startling observations, generally passed over in the literature. The first is that the summer solstice is the traditional birthdate of the great immerser, John the Baptist. To be precise, his nativity is celebrated three days later—on June 24—as if to allow for three days of darkness! Those three days, of course, are the ‘days in the grave’ between the last of the old moon’s light and the first light of the new moon—the resurrection. Thirdly, June 24 is also the great feast of the god Adonis, when he metaphorically died (to great wailing of women), only to be resurrected after three days. Jerome anciently observed: “The one whom we call Adonis, he is named Tammuz in Hebrew and Syriac… In the month of June he is supposed to have died and then resurrected again, and for this reason the month is named Tammuz” (On Ezek. 8, Migne Lat. XXV.82). All this is most intriguing, but it should be noted that we have not spoken of Jesus. We have spoken of John the Baptist’s birth, death, and resurrection! These events occur, nota bene, exactly six months from the birth of Jesus on the winter solstice—that is, as far away on the calendar as possible the one from the other! Jesus of Nazareth now somewhat eerily enters into the picture—as an interloper. He was by tradition born in a cave of Bethlehem. However, that very cave (Jerome obligingly informs us) was dedicated by the heathen to the worship of Adonis. Jerome would have us believe that the ‘heathen’ secondarily transformed the cave to their use. But the increasingly regnant Christians would hardly have tolerated that! And if the heathen were second, then would not the cave still be dedicated to Adonis? Yet it is dedicated to the birth of Jesus. Finally, the cult of Adonis/Tammuz is most ancient, while that of the Christian relatively new. It is clear that Adonis was the first to be venerated in the Cave of Bethlehem, and that the Christian Church usurped both the veneration and the cave for Jesus. We have now come full circle: In Christian times, John the Baptist replaced a most ancient water god. One would think it would be Jesus, not John! This is a hint—one of many—that Christianity was originally gnostic and centered not on Jesus of Nazareth but on the water cult of John the Baptist/Adonis. In the posts thus far, water has been the common theme from Stone Age times to Late Antiquity—from the the great ocean ‘beyond’ (home of the celestial orbs), to veneration of the moon (which rules the tides), to the great feast day of the water god (Dumuzi-Abzu, Adonis, John the Baptizer) at the summer solstice. And yet, in all of this long history, water is a powerful, unifying symbol. While the physical substance is ubiquitous, indispensable and life-giving, the spiritual symbolism of water is equally life-giving: gnosis. • Christianity was originally gnostic and centered not on Jesus of Nazareth but on the water cult of John the Baptist–Adonis. Following Jean Magne, Origines Chrétriennes: Logique des Sacrements, I understand the serpent-in-the-tree as the origin of the eucharist, whereas the Hermetic initiation described in Poimandres constitutes the prototype of the baptism. The sacraments retained their basic rites even while their justification was increasingly historified and presented as the consummation of the law and the prophets. In re-reading the Poimandres, I now note certain clear Buddhist motifs: “desire is the cause of death” ; being wary of the senses and sexuality ; and the root problem is “ignorance” .